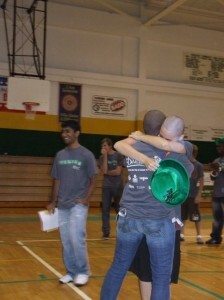 Shauna-Kay and I hug after the headshaving. On a bright Wednesday afternoon in early spring I decided the weather was ripe for a major haircut. My stylistâ€™s name was Domaris and she started telling me about her relationship with her 16-year-old daughter. Together she and her daughter enjoyed watching Extreme Makeover: Home Edition, she said. Iâ€™ve actually never seen any of the Extreme Makeover shows. This wouldnâ€™t be unusual except that one of my dearest friends had her home remade by the show. I told Domaris about my friend Shauna-Kay and how her family had been recommended by someone in their church to receive a makeover. Domaris perked up. She remembered the episode, and she wanted to know more. At the time of the showâ€™s taping four years ago, Shauna-Kayâ€™s dad was battling cancer. Â He had moved his family from Kingston, Jamaica, and become a citizen shortly before being diagnosed with chronic lymphoma. The cancer was just another hardship in a long line of struggles.Â Since coming to America, Shauna-Kayâ€™s family never had enough money. Â In Jamaica, her dad earned money as a cobbler. In suburban Florida, that wasnâ€™t much of a trade. Her family had a small house in a rough neighborhood that they shared with two of her aunts and her cousins. From the show, Domaris knew Shauna-Kayâ€™s dad had been sick. She wanted to know about his health and I had to tell her he had died soon after the show aired. Domarisâ€™ curiosity made me feel self-conscious. Shauna-Kay is a very private person. When I asked about her dadâ€™s health she usually lied and said he was doing â€œfineâ€ or â€œbetter.â€ Shauna-Kay didnâ€™t tell me heâ€™d died until several weeks after, at which point I already knew because Iâ€™d seen the obituary. I wasnâ€™t sure what Shauna-Kay would want me to tell Domaris. Her questions reminded me how little I knew one of my best friend compared to what the average ABC junkie knew about her. I realized Iâ€™d never been invited to her house before the makeover. Domaris had seen the â€œbeforeâ€ images while I had not. Through the television screen, Domaris had met Shauna-Kayâ€™s dad. I never had. Sheâ€™d met the two aunts whom Shauna-Kay lived with a year before I had. She knew more about the renovation and construction of the house than I did, and I was the one who had been inside it. The conversation made me feel disconnected from Shauna-Kay. I tried to tell myself that Domaris didnâ€™t know Shauna-Kay; she just knew a disarming amount about her. I chastised myself because I know how special Shauna-Kay is. I reminded myself that it was good so many people had seen how happy her family was with so little. I felt that sharing her with this stranger should make me feel closer to her but instead I felt removed and uneasy. I looked down at all my hair on the salon floor and remembered something important about Shauna-Kay that Domaris didnâ€™t know. My thoughts transported me to a day almost two years ago exactly. Shauna-Kay decided to shave her head in memory of her father as a fundraiser for a cancer-charity called St. Baldrickâ€™s. Her boyfriend and I said weâ€™d do it with her. My brother jumped in too. Word spread through our high school and we were joined by two other boys. The six of us raised more than $5,000 and the local paper sent a reporter to the head shaving event. It published the photo of me and Shauna-Kay, newly bald and hugging. Itâ€™s one of my favorite photos ever taken. In the Hair Cuttery, I realized that that memory too was public and not my own. I potentially shared that memory with anyone who read the Palm Beach Post on April 1, 2008. For such a private person, big moments in Shauna-Kayâ€™s life have been documented. But during the hug in that photo, Shauna-Kay said something to me that I will always treasure.Â That memory cannot belong to Domaris or readers of the Palm Beach Post or even Immigrant Connect. In that memory is the essence of my relationship with Shauna-Kay and it may be selfish but that memory is mine.